Selling your products on Amazon can produce more sales and also direct customers to your Actinic website. When you sell a product on Amazon they deduct an agreed percentage commission (e.g. 12%) from the selling price. You should sell your products on Amazon at the same price (or less) than that shown on your main site. There are several points to consider before listing your products on Amazon. 1 You will need to add more details to each of your Actinic products (using Actinic Custom values). This is additional information required by Amazon that Actinic does not provide (by default). Product ID If selling a product that Amazon already sells this is the ASIN (Amazon Standard Identification Number). If you are selling your own products this is the EAN (European Article Number), the barcode. If are using Actinic EPOS you may already have entered an EAN for the product. If you are using Actinic EPOS you can use the !!BarCode!! macro for the value for this field. NOTE: You must specify an EAN/ASIN. If one is not present or of the correct length the product will be rejected by Amazon. However, this can be useful if you want to see if your products would be accepted by Amazon. If you set this value to '8' the products will be rejected by Amazon due to an invalid EAN/ASIN, but all the other fields will also be validated. 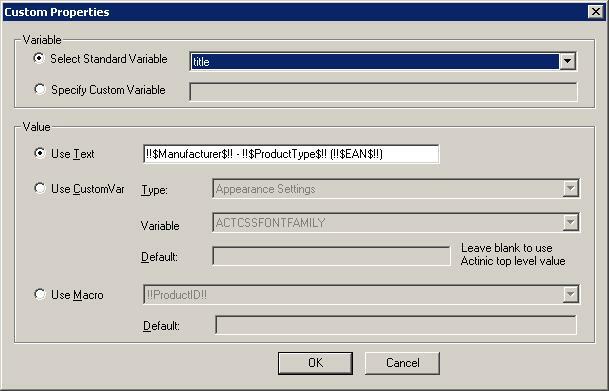 If the only field that is reported on as being invalid is the EAN/ASIN then you know that your products will be accepted when the correct EAN/ASIN value is used. Brand The Product Range name, e.g. ProLite. If you leave this field blank, or don't include it Amazon will automatically use the Manufacturer value. Browse Node The location in the Amazon Catalogue to place your product. People will still be able to find your product using searches if this value is not filled in (or uses a default value). This list can change. Click here for the current numbers to use. Manufacturer The company that makes the product. Some of these properties can be read from the Actinic section name or added to a section of products. The only custom value that will need to be added to all products is the unique product code (Product ID). The others can be defaulted or derived from other Actinic values. 2 If you have a single product on Actinic with no choices or options this can map directly to an Amazon product. However, it is quite hard to map products that have several choices to a single Amazon product. The way that this can be done is to change your Actinic product permutations to map each permutation to a hidden Actinic product for each choice (and then export the hidden Actinic product to Amazon). 3 When you have sold your products on Amazon there are several tools that can improve order processing. You can use Integrated Label Paper. For more information click here. To also manage the Amazon emails, shipping confirmations, couriers etc. you can use One Stop Order Processing MC. For more information click here. 1 A standard Pro merchant account. You login to the main Amazon site (e.g. http://www.Amazon.co.uk). This is for people who sell standard products that already exist on Amazon. You would need the current ASIN from Amazon and can list your products against others that already exist. Using this account type you must use the Amazon model for shipping costs. 2 An Experienced and Volume Seller. You login to their SellerCentral site (e.g. https://sellercentral-europe.amazon.com). This is for people who sell products that Amazon don't currently sell. To list a new product on Amazon you will need its EAN (or barcode). If the product does not have a barcode, for example, a handmade wooden toy, you will need to assign your barcode to the product (and supply this to Amazon). To see how to do this see the Creating your own barcodes section. Using this account type you can also set your own shipping costs (including Free Shipping). Amazon will need Credit/Debit Card details and/or a Bank account to collect your monthly fee (currently £25 + VAT) and to pay you your sales money. 1 On the Product Mash main screen tick either Amazon (Marketplace), if you login at http://www.Amazon.co.uk or Amazon (Seller Central), if you login at https://sellercentral-europe.amazon.com. The properties for Product ID, Title, Description, Image and Price are automatically filled in from the Actinic details. The other details required for Amazon, with details on how to set the properties, are described below. 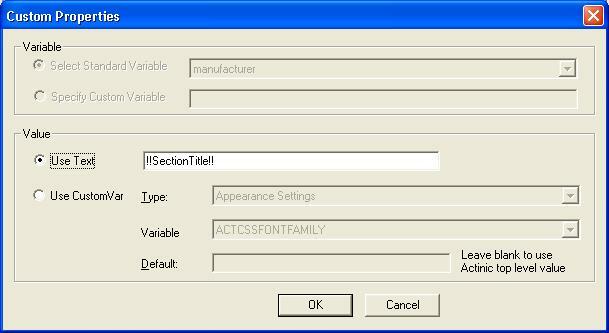 These additional values can be taken from other Actinic fields, custom values or entered text. Depending on what your shop sells or how the products and sections are configured you can choose which is the approach for each property (value) required by Amazon. product-id Set to the new Actinic Custom Value, containing the ASIN, EAN or ISBN for the item already listed in Amazon. See Setting up Actinic Custom Values for more details on how to create these values in Actinic. product-id-type What type of value is described in the product-id, for example, ASIN. 1 Create an Actinic Custom value called AmazonIDType. 2 Assign a default value of EAN. 3 For each product that uses an ASIN set its value on that product (or section) as ASIN. 4 Change the Custom Properties of the Amazon product-id-type to reference the newly created Actinic Custom Value. item-condition Defaulted to New, but you can select various other conditions (e.g. used, very good). In Actinic V10, this property can be mapped to the default "Google Data Feed Product Condition". will-ship-internationally Defines where you ship to. Amend the value if you also ship outside the UK. Only some of the properties shown below will apply to a specific category. As with all the feeds, only those properties required are shown when a category is selected in the Product Mash. standard-product-id Set to the new Actinic Custom Value, containing the ASIN, EAN or ISBN for the item already listed in Amazon. See Setting up Actinic Custom Values for more details on how to create these values in Actinic. product-id-type What type of value is described in the product-id, for example, EAN. This is the barcode value. manufacturer The company that makes the product, for example, Nike. As with all the values this can be a fixed value, taken from an Actinic section title or a custom value. product_type The sub type for a category. For example, ConsumerElectronics. currency The currency you are selling in. This defaults to GBP (£). quantity The number of items that you want to be made available for Amazon. If you use the value !!NumberInStock!! this will use your current Actinic stock. item-condition Defaulted to New, but you can select various other conditions (e.g. Used, very good). ItemPackageQuantity The number of items for sale in a unit. For example, 6 (plant pots per pack). TargetAudience Who the item is for. For jewelry this is used to allow easier searching of items. recommended-browse-node The location within Amazon to put your product. This list can change. Click here for the current numbers to use. If you want to enter more than 1 browse node click on the Add button (in the Product Mash) and select the other properties, e.g. recommended-browse-node2). clothing-type Used for Apparel to make it easier for customers to browse items. For example, Dress. material-composition Used for Apparel to make it easier for customers to browse items. For example,Cotton. department1 Used for Apparel to make it easier for customers to browse items. For example, Womens. style-keyword1 Used for Apparel to make it easier for customers to browse items. For example, Apparel. 3 Add in any extra properties that are specific to your needs (e.g. item-weight with a value of !!Weight!!). 4 Amazon has separate shipping costs, not directly associated with a product. If using Amazon (Marketplace) you will automatically use the Amazon shipping costs. If you use Amazon (Seller Central) you can use your own shipping model. This is setup in Amazon in the Settings->Shipping Settings page. You can use a price based or weight based system. If you want to use the weight based system you should add the weight property and use a value of !!Weight!!. This will use Actinic's weight of the product. Amazon uses Kilogram as its weight unit. 5 Create your feed file from the Product Mash. On the main screen click on Mash Now. 6 Import the created feed file into Amazon.
. Go to the Manage Your Inventory section. NOTE: Your items can be available to buy within a few minutes (at certain times) when uploaded to Amazon. It is a good idea to only list a few products to start with to see how they look (and sell). Your products should now be on the Amazon website ready to sell. You will be emailed (by Amazon) when you have orders to process. See the Order Processing section for more details on how to process and ship orders. Using this approach you can use any of the following macros to provide the correct values for the Amazon properties. !!DeliveryCost!! The calculated delivery cost.
. Look for any text before a - (a minus sign). This is used in the field.
. If a - (minus sign) can't be found a tab character is looked for.
. If a tab character can't be found look for a space.
. If a space can't be found use the whole title text. Even though this can be used for brand it can also be used for other fields. !!SectionTitle!! Take the title text of the product's section. If you define your product's section with information that can be used in your feeds you can use this value. !!ParentSectionTitle!! As above, but use the parent section of the section that the product is in. !!ParentParentSectionTitle!! The same as !!SectionTitle! !, but use the parent's parent section of the section that the product is in. !!SectionTree!! Use the section hierarchy (e.g. VIDEO->VHS->OLD). !!BarCode!! If you are using Actinic EPOS this uses the product barcode (EAN). To taylor Actinic to your business you can create custom values. Custom values are additional pieces of information that can be assigned to each of your products within the Actinic catalogue. These additional values can be used in all areas of your shop including your website and in the feeds created by the Product Mash. Amazon requires additional information not available in the standard Actinic setup. This section explains how to add these additional values to your existing Actinic products. 1 Under the Design menu option select Design Library, then the Variables tab. 2 Click the right mouse button and select the New Group menu option. 3 Type in a name of Product Mash. This is the Group where all of your feed variables will be defined. 4 Select the new Product Mash Group and click the right mouse button and select the New Variable menu option. 5 Enter a Name (e.g. Manufacturer), Description and Prompt. In general it is best to have the same name for the Name of the Variable and Prompt (this makes it easier to find in the Library). 6 If the Group is not set to Product Mash select the Product Mash group. 7 In Place of Setting, tick Section and Product. This is the area within the Actinic Catalogue where the value can be set. 8 You can change the Page where you can set the value of the variable. By default this will be the Properties page. To make it easier to fill in these details for all new products change this value to General (the main product and section page). 9 If you leave the type as text and Allow empty Value is ticked. 10 In the box at the bottom leave Initial Value as Use Parent(). This means that if you leave this value blank it will use its parents value. For example, if you have a Variable called Manufacturer and define its value in a section, to Trinitron then each product within that section will automatically have the value Trinitron for the Variable Manufacturer. If you want any product within that section to have a different value you simply amend the Manufacturer Variable value in that product. 11 To see these values within the Products Mash you will need to restart the Product Mash. Under the Advanced Menu option select Custom Properties. Click on the [+] box (top left) and type in the name of the custom var. For example, Manufacturer. In the Product Mash, click on the Feed Options button. Select the relevant feed tab (e.g. Amazon SellerCentral). 1 Click on the Add or Edit button in the Property (or Custom Property) area. 2 Select the relevant property (if a property is being added) in the Variable area. 3 Under Value select CustomVar. 4 For Actinic V8 onwards select the group where the value is defined (e.g. Product Mash) and then the relevant Variable that you have created (e.g. Manufacturer). 5 Type in a Default value (if required). This will be used if you don't assign any values to a section. For example, for Manufacturer, if you enter your company name (e.g. Smiles Sports Shops), this will be used if the value is not defined at a product or section level. If the Default value is left blank, it will automatically default to the Actinic Top Level setting (where set). 7 In Actinic go to the Properties or General tab on each product or section that you want to define a value for (e.g. Sony). Prices for (up to 10,000) codes is from £99 + VAT. The cost depends on your company turnover. It takes less than an hour from applying to getting your barcodes created. Once you have a barcode you need to enter this into Actinic. You can either use these values as your Actinic product ids or as custom variables. For information on how to setup Custom Variables see the Setting up Actinic Custom Values section. Your Amazon orders can not be imported into Actinic. A lot of Amazon sellers take all of the Amazon orders and enter them into the accounting software (e.g. Sage) as a single entry (e.g. Amazon Sales). This saves on data entry time and does not get you to the limit of the accounting software (particularly for Quickbooks). This export feature (to Quickbooks and Sage) is included with One Stop Order Processing MC. For improved and easier order processing you can use One Stop Order Processing for MC at www.1stoporders.co.uk. One Stop Order Processing MC can also update Amazon SellerCentral shipping confirmations and send emails (for multiple orders).